About a month ago, a friend approached me with an idea to get a kind of "Theology on Tap" thing going before poker nights at a local bar. I thought it was a good idea, and what started out as inviting just Catholics to talk on various theological issues, soon grew into inviting people from other Christian denominations. While the first "conversation" has yet to happen, my friend made a nice resource online where we could all interact with each other and post sources that we could look over before our discussion. Our first topic was going to be on the Eucharist, and after some people, including myself, posted some sources for the Catholic doctrine of transubstantiation and for the teaching of the Real Presence in the Eucharist, a Baptist posted some articles that were critical of Catholic theology. A couple of his papers were actually well-reasoned, and shed some insight on Calvanistic thinking towards the Eucahrist. However, one of the articles posted came from the ever dubious Matt Slick, writer for the Christian Apologetic and Research Ministry (CARM). If you haven't heard of him before, then you're one of the lucky ones. While some of the articles on his website have some merit, especially the ones against atheism and misunderstandings of Old Testament Laws, Slick has an anti-Catholic streak, and you can see it here on his article on transubstantiation. Now in a few instances in this article, he accurately reflects what Catholic theology teaches in some place. Then in others, he offers a completely inaccurate portrayal of Catholic thought, giving a complete misrepresentation of the theology behind transubstantiation; thus Slick is attacking a complete caricature of Catholic beliefs instead of interacting with what Catholics actually believe. Now, I want to get relevant and helpful information to as many people as possible through this little blog. I come across a lot of very helpful essays, websites and blog postings that I want to share with people. While I do write some original apologetic essays, I want to give Catholics and other non-Catholic Christians alike access to these helpful sources that they might not have found otherwise. 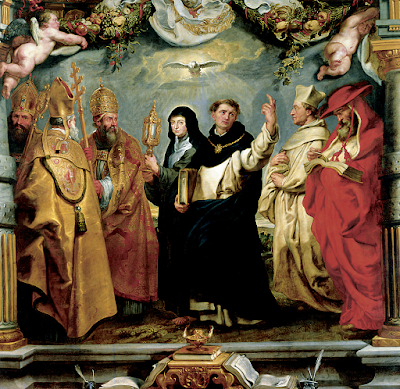 Therefore, I offer the following rebuttals (point by point) to Slick's article on transubstantiation, and in these rebuttals I will post links to various Catholic websites/blogs that can articulate this information much better than I can, and will summarize in my own words some of these other sources to help explain what you will find once you click on the links. Apologist Dave Armstrong has a great reply to this claim often given by Protestants, which provides some great exegesis on John 6. As I've heard before by many theologians, if you have a problem with the Real Presence in the Eucharist, then go to John 6. Jesus is not speaking the language of allegory or symbol. Also on Matt's first point he argues that, "Jesus frequently spoke in spiritual terms". He makes an argument similar to the one rebutted by the writers over at St. Michael's media which begins, "Okay, I see that Jesus says that this is His flesh – but He also says He is a door (John 10:9) and a vine (John 15:1)! What about that? Is Jesus a door too?" Obviously, Jesus is not a door. Not to mention, there's a stark grammatical difference between these two Scripture references and Christ's declaration of "This is My Body." Jesus does not say, "The bread is my body", because that would make no sense. Read more under the second bolded and italicized question on this page. 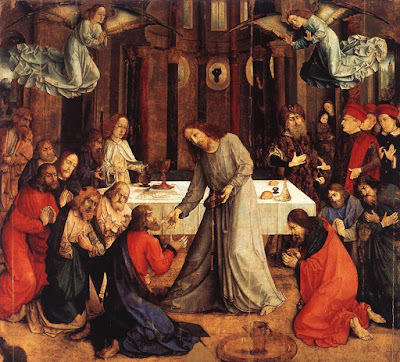 On Matt's second point where he claims "the elements of the communion supper were still referred to as bread and wine": This point is thoroughly rebutted in the page that I just previously posted. This is an example of phenomenological language being used in Scripture. There are some examples given at the link above, specifically in answer to the fourth bolded and italicized question. On Matt's third and fourth points where he claims "there is no indication the disciples thought the elements changed [and] no indication the disciples worshipped the elements": Quite simply, this is a logical fallacy. Specifically, this is an argument from silence... and it cuts both ways to be honest. This is why these two points do nothing to bolster Slick's claims. How do we know that the disciples thought the elements changed? Christ said that "This is My Body", right? And how does he know that they did not worship Christ then and there? Note I did not say "elements" as Slick did. We as Catholics do not worship the elements or "accidents" have the bread and wine. We worship Christ who is present before us! 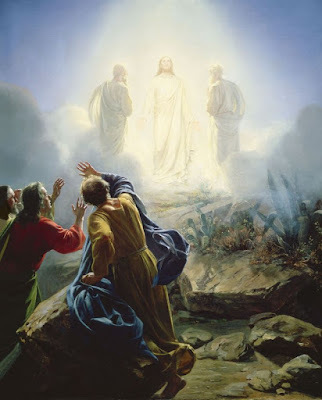 The apostles already knew at this point that Jesus was God (remember the Transfiguration? ), so how can Slick definitely say that the apostles were not worshipping Christ around the Eucharistic table? On Matt's fifth and sixth points where he claims "the supper was instituted before Jesus' crucifixion [and] the Roman Catholic view is a violation of Levitical law": Apparently, Slick doesnot' realize that Christ is not confined by time. Otherwise how were prophets and patriarchs like Abraham and Micah saved during the Harrowing of Hell? Also, Slick seems to be a bit inconsistent with picking and choosing between Levitical laws. Apparently, he has forgotten that there is a distinction between the ceremonial laws and the moral laws of the Old Testament. This sacrifice takes place outside of time, and the authors over at Unam Sanctum Catholicam explain this in a very excellent manner in a piece that rebuts many of Slick's other charges against the Catholic Church. Read more on these rebuttals to Slick's fifth and sixth points over here, specifically the first and second questions under the "Eucharist" heading. On Matt's seventh point where he claims "[transubstantiation] is a violation of the incarnation": It would appear that Slick seems to misunderstand the teaching of communicatio idiomatum. In addition, God is fully capable of appearing in any form He wants. God did so in the burning bush when he appeared to Moses. Was God not also in heaven when this happened. Remember, since Jesus is God, His divinity is equal to that of the Father. This is why in the Nicene Creed we say "God from God, Light from Light, true God from True God." Once again, The folks at Unam Sanctum Catholicam give a good answer, found under the third question in the Eucharist heading. Also on the seventh point, this essay from Shameless Popery goes much more in depth and totally brings the house down on Matt’s claims, talking on how Christ’s body can be present in the Eucharist… especially since we are talking about Christ’s glorified body. On Matt's eighth pint where he claims "the Lord's Supper is not a sacrifice of Christ": Again, let's look for the answer over on the same website from the first rebuttal, under the question asking "Jesus says “it is finished” and His sacrifice was “once and for all” - what's all this with multiple sacrifices?" First off, there are no multiple sacrifices. Every sacrifice at every Mass is the same sacrifice that happened on Calvary. Christ is not re-sacrificed as Slick tries to claim Catholics as believing. This video from Catholic Answers may be helpful in driving this point home. But if you are wanting a much more thorough refutation of Slick's final point, then I suggest reading this essay on the subject of a "re-sacrifice". It's long, but it's exhaustive and for those with questions, it gives plenty of answers on how Catholics can answer the charge of Christ being sacrificed again. This is just one of many articles where the writers at CARM try to distort and belittle Catholics in their beliefs. As we can see, many of their assumptions are wrong, and by appealing to Scripture and Tradition, we can see that many of these points are able to be refuted. Some easily, some with a little more effort. But as the cliche goes, the Truth will prevail.